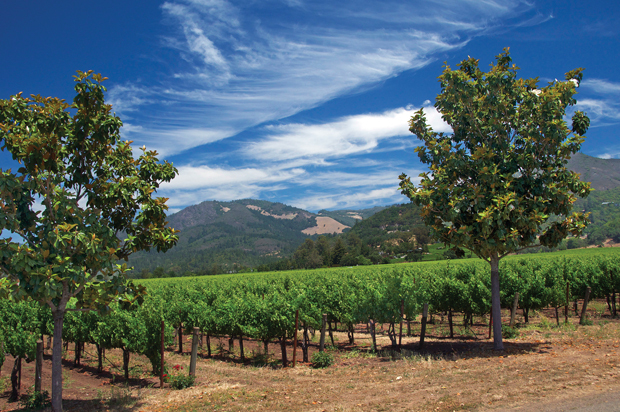 By the end of the first morning of my first visit to Napa and Sonoma twenty-five years ago, I was ready to call it quits. Traffic was snarled. Tasting rooms were jammed. At the end of our rope, we decided to make one final, desperate attempt to catch a bit of wine-country magic… and were royally rewarded. Our wine tender — who we later learned was the winery’s owner — poured tastings from reserve bottles, showed us the barrel room and regaled us with stories. We left happily sated and weighed down by six bottles of Chardonnay. Subsequent visits have only added to the treasure trove of memories: over the years, we’ve attended a wedding in an apple orchard, hiked through hilly vineyards and watched in awe as a local priest blessed the vines on the first day of harvest. After last year’s fires roared through vineyards, neighborhoods, schools and forests in both Napa and Sonoma, I wondered what I could do to help this region I’d come to enjoy so much. Turns out it was easy: visit. So I did. Here’s what I found. As much as I love the idea of bedding down at a luxe resort surrounded by vineyards, I get even more excited when I can walk to restaurants, bars and shops. That is just one reason I adored Vintage House, a chic 80-room hotel that opened in October on Yountville’s main street. After a glass of sparkling wine at check-in, I made my way to an oversized room that overflowed with fun surprises like an anti-jetlag kit (herbal tea, bath salts, chocolate) and a stone fireplace set with an easy-to-light bag filled with kindling and wood. There’s also a fabulous spa (the five-hour Suite Retreat takes place in a rooftop oasis complete with a fireplace and soaking tub) and a serene pool. Smaller and less touristy than both Napa and St. Helena, Yountville is the kind of place where the winemakers meet for coffee at Kelly’s gas station before work and the local mercantile, Hunter-Gatherer, stocks everything from crocodile loafers and copper dog bowls to badger shaving brushes. Wonderful restaurants abound; if you can, book the garden table at Lucy, in the Bardessono Hotel, which is tucked behind a fragrant screen of by lemon trees, rosemary bushes and all manner of edible greenery. It’s as lovely as it is delicious. Turning off the Silverado Trail into the dramatic green valley that envelopes Odette Estate, I had a nagging sense of déjà vu that I just couldn’t shake. Then it came to me. Sipping wine at the tiny Steltzner winery in 2010, I discovered that the friendly and well-informed man in overalls serving my wine was none other than Richard Steltzner. Two years later, Steltzner sold the property to a group who converted to 100% organic farming, replaced the original rustic tasting room with a stylish glass-walled space filled with velvet sofas and massive sprays of orchids and renamed it Odette Estate. Steltzner may be gone, but Odette has maintained his welcoming, unpretentious legacy. And the wines? Jeff Owens’ inaugural release for Odette Estate was awarded a perfect 100 points by The Wine Advocate. No matter how often I visit Sonoma, I always try to make my way to Jordan Winery. Not only are the Bordeaux-style wines refined and elegant, but the tasting experiences are fun and diverse. Beyond library tastings in the French-style chateau, the winery’s tasting portfolio includes vineyard hikes through meadows and forests followed by a wine and charcuterie pairing and estate tours with stops for food and wine under ancient oak trees and beside cool lakes. On the surface, Healdsburg seems like an all-American town, and it is. Kids ride bikes on the sidewalks, there’s a dog bowl outside nearly every shop and there are even two locally-owned book stores on the leafy town square. It’s also become a destination for young chefs and winemakers, who raise their families here while perfecting their art. At Idlewild, third-generation winemaker Sam Bilbro specializes in Italian varietals; on the night I visited the tiny tasting room, we sipped a lush 2015 Cortese while one of his children quietly did homework in the corner. Wine and art come together at GrapeSeed, where founders Dave Trebilcock and Matt Smith curate unique, small-lot tastings surrounded by paintings and sculptures on display in Paul Mahder’s expansive gallery. Then there’s Valette, a restaurant owned by Aaron Garzini and Dustin Valette, brothers whose roots in Sonoma go back generations. The menu is a who’s who of fresh California ingredients—handcrafted cheeses, fresh herbs, a rainbow of produce—paired with enough French sensibility to render each dish both decadent yet focused. Tiny day-boat scallops, for instance, came in a sumptuous beurre blanc warmed by fennel; foie gras met a new life partner when Vallette introduced it to pickled shallot. Since it’s impossible to choose (or make a mistake), leave it to Valette and order the “Trust Me” menu. On the way out, be sure to say hello to Valette’s father, Bob, a California Fire pilot who brought rescued families to the restaurant, where the team fed them at no charge for days. It’s an easy walk to Hotel Healdsburg, a 56-room Design Hotel filled with big resort amenities like a huge fitness center, pool, spa, complimentary valet parking and an in-room fridge loaded with locally-produced snacks. It’s one of those rare low-key places where staff would be happy to help, but you don’t need it—everything you need is right where you want it. On the way out back to San Francisco, save time to stop at Ram’s Gate, which sits at the southernmost point of Sonoma County. Although regulations don’t allow wineries in Sonoma County to have restaurants on site, the owners of Ram’s Gate got around this pesky rule with Palate Play, a five-course set pairing that just happens to be large enough for lunch. It’s a stunning setting, too, with a gorgeous tasting room perched on a bluff overlooking a lake.